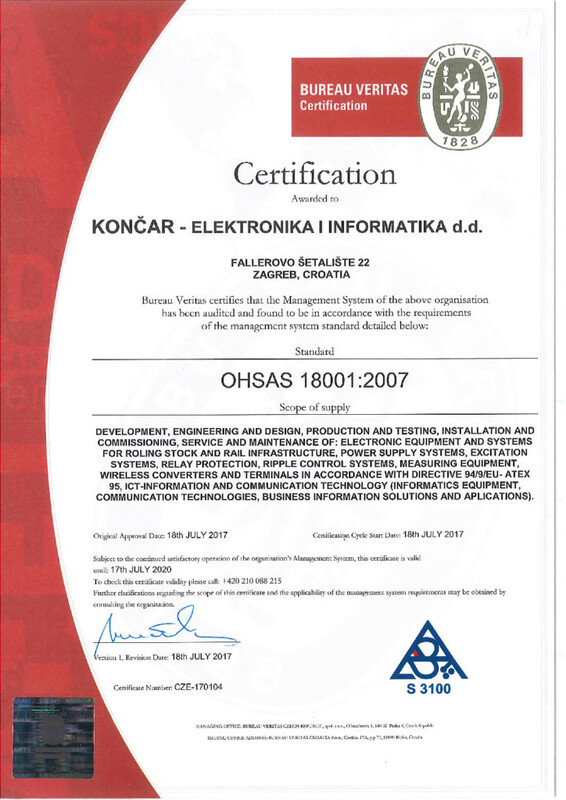 ﻿ KONČAR – Electronics and Informatics holder of the OHSAS ISO 18001:2007 certificate – KONČAR Elektronika i informatika d.d. Since last week, KONČAR – Electronics and Informatics became a proud holder of the OHSAS ISO 18001:2007 certificate, globally recognized Health and Safety Management System. This is fully in line with the philosophy of the company and the group to which it belongs, oriented at all times towards the individual with the utmost conviction and responsibility. The audit was carried out last month by experts from Bureau Veritas, and now an official certificate was issued and is valid for the next three years, of course, with mandatory annual control. Improving business quality in KONČAR – Electronics and Informatics is permanent, as well as the determinant and long-standing practice and because of that, we always strive to be aligned with the latest ISO standards. The first step was made twenty years ago when we were awarded with first certificate for the Quality Management System (ISO 9001), and since 2003 we were certificated according Environmental Management requirements (ISO 14001). The development of the management system has shown the need to validate and integrate the Health and Safety Management System into the already introduced Quality Systems and Environmental Protection and has been successfully acknowledged by this certificate. The Health and Safety Management System is fully in line with the OHSAS ISO 18001: 2007 standards. We will continue to work actively to keep track of all relevant professional standards and meet the highest demands and thus provide the highest value to our customers and our employees.